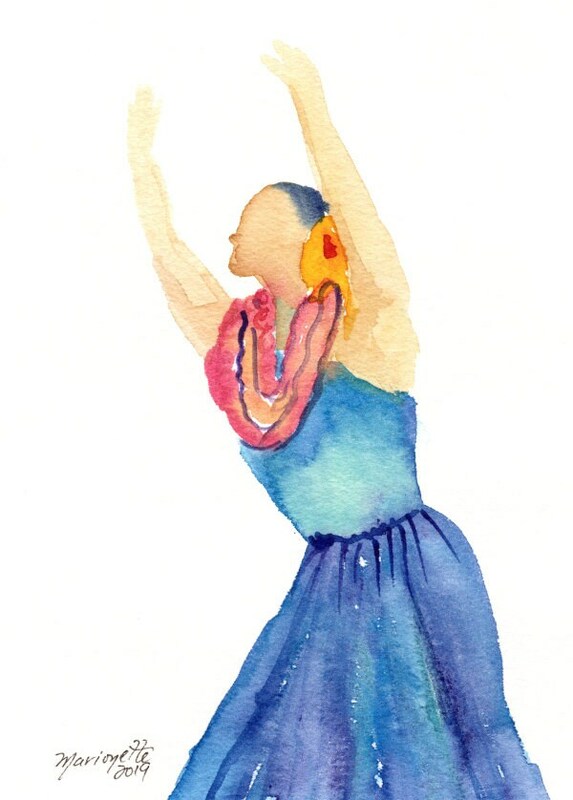 This hula dancer is one in a series of original watercolors. They were painted with a minimalist style using a sumi e or Chinese brush painting like technique with watercolor paints on watercolor paper. My intent was to capture a quick glimpse of the hula dancer in motion. "Hawaiian Hula Dancer 8" is an original watercolor painting measuring approximately 5"x7" and comes with a signed "Certificate of Authenticity" and packed in a clear sleeve with a backing board (unframed). Colors may vary slightly from monitor to monitor. I use only the finest quality art supplies in my watercolor paintings - 140 lb. CP Arches watercolor paper and Winsor and Newton paints. Also, my art has been certified and accepted by the County of Kauai into their "Kauai Made" program which represents those products made on Kauai, by Kauai people. The item will ship via USPS First Class anywhere in the world. I hope you have enjoyed the painting. Have a warm and beautiful day. Once again, Aloha from the Garden Island of Kauai! Your payment information is secure. Sellers don't receive your credit card information. Please place orders to the U.S. by December 10, 2018. Please place International orders by November 19, 2018. All items will be ready to ship in 1-3 business days. I will ship your order to the address you have provided on the sales order. Being on the island of Kauai, I have found that USPS is the most reliable and economical way of shipping items. I will ship the item either First Class or Priority Mail depending on the size and weight of the item. ***Please note: Shipping fees include postage, handling, and packaging materials. Buyers are responsible for return shipping costs. If the item is not returned in its original condition, the buyer is responsible for any loss in value. Plus, the buyer is responsible for the shipping costs to reship the exchanged item. I take great care to properly package and protect your artwork. However, if you receive the item damaged, please contact me immediately. I will make every effort to refund your money or provide a satisfactory replacement, if possible. However, I do require photos of the item as proof of damage. For all original art pieces, I insure it with the post office (U.S. Domestic) for the full value of the artwork, so please save the package and all packing material so we can file a claim. Custom orders and wholesale orders are always welcome. Please note that colors may vary from monitor to monitor. address. I do NOT have access to your financial information in any way as Etsy Payments or PayPal processes your order depending on the method you choose. • Service Providers. I engage certain trusted third parties to perform functions and provide services to my shop, such as delivery companies, i.e. The United States Postal Service. I will share your personal information with these third parties, but only to the extent necessary to perform these services. • I do NOT send promotional emails using the email address which you have provided when registering for Etsy.com. All conversations will be handled through the Etsy internal "convo" system. • I will NEVER contact you for market research purposes, spam you, or solicit you in any way using the information provided to me. I do not store store or process your information through third-party hosting services in the US or other jurisdictions, period. • Object. You can object to my processing of some of your information. In such cases, I will delete your personal information unless it is needed for legal reasons. For purposes of EU data protection law, I, Marionette Taboniar, am the data controller of your personal information. If you have any questions or concerns, you may contact me at artbymarionette@yahoo.com.